My next step is to build the base board. So with the ply cut to size, I needed to know where the point motors and ice skater pond are going to go, this is so that when I build the base board frame work, I want to make sure that none of the wooden PSE batons run under neath at these areas. So after laying out the track, we decided where the buildings were going to make a nice pleasing view. This is what Jess and I came up with. We are now also looking a putting a station halt in on the front left hand curve. 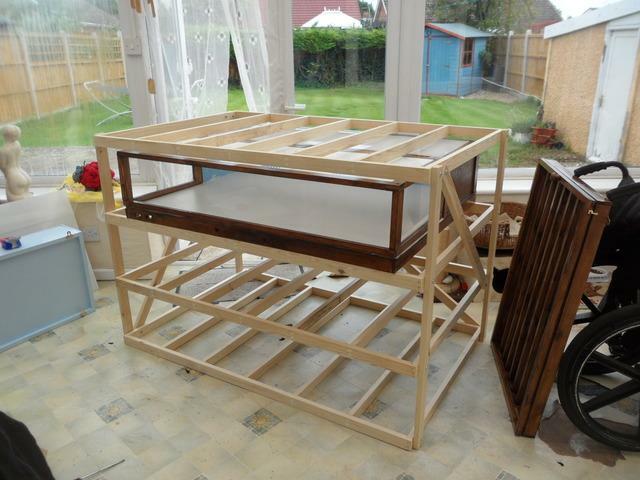 Over the last month, I've been working on 12 different woodwork/carpentry projects . 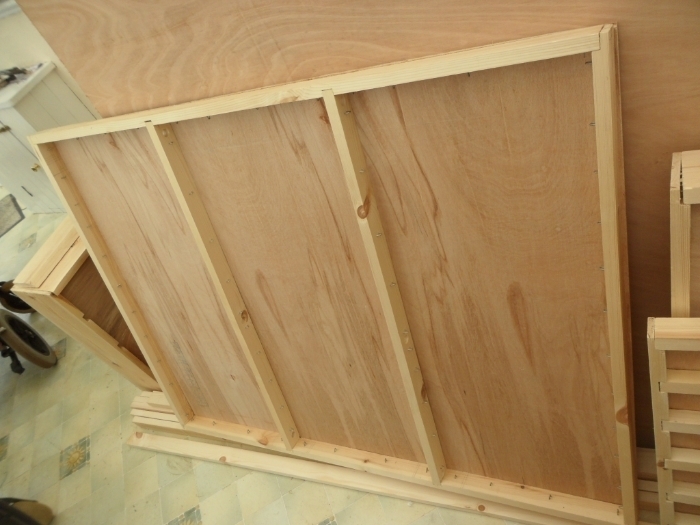 On of them which is still a working progress is to build the base board for the model layout. I've fitted to the ply base some PSE 2x1 baton. I've mitre the joins. I've also drilled holes in the cross frames and added staples to neatly run the electrical wire at a later date. 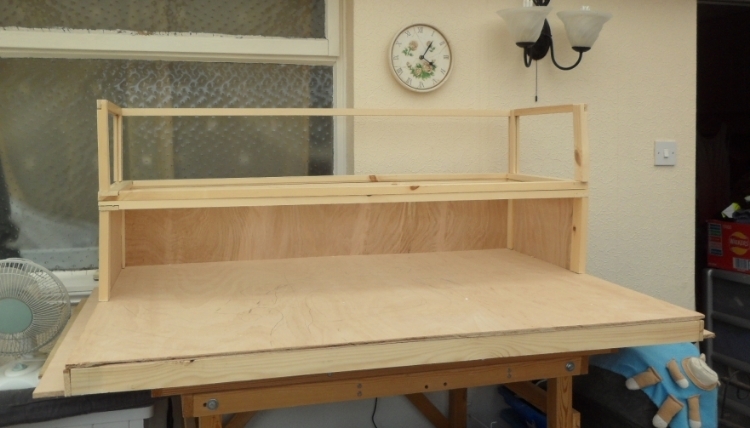 Like I said, this is a working process and my next step is to build a cabinet to co on top to help protect the layout. 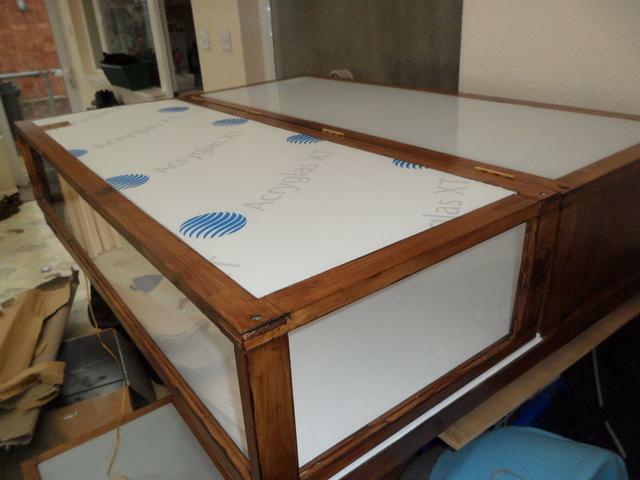 The upper display case for the base board is now test fitted together waiting for painting/varnishing, glazing and hinges fitted. The front half will hing open over the top of the rear half for access. I'll be using a brown gloss varnish for the wood as used by my Black Pearl case. I didn't want too much white especially as the board will be covered in snow. I though some contrasting colours would be nice. 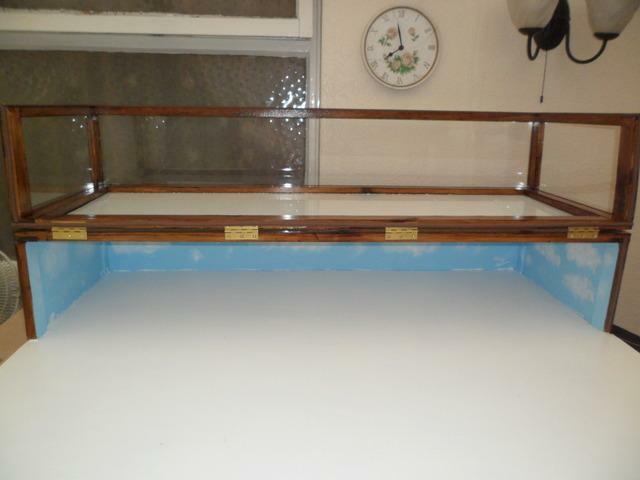 The glazing will be acrylic (perspex). ps.. If any one is wondering if the top frame looks out of line with the front, that is because it is due to the fact it hasn't been lined up and fixed with a screw yet. 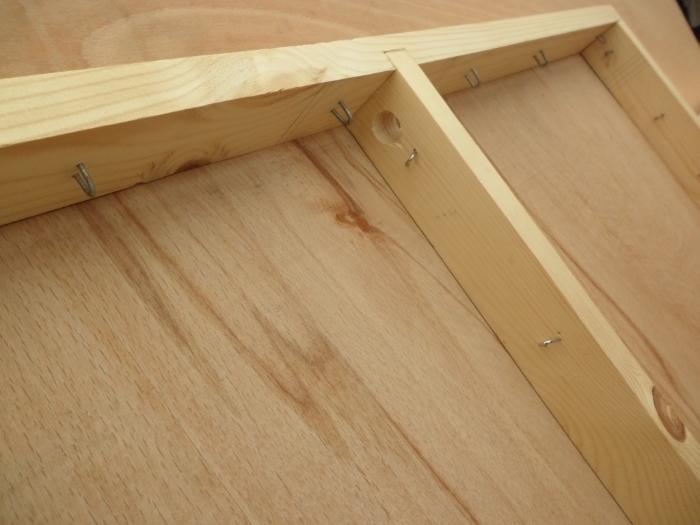 The top frames will be only screwed together to allow removal to replace the glass as well as allowing better access to the board as and when needed. Manoverboard wrote: Hi Roy ! I think you are taking the "P" again! I don't know if will manage to get this completely finished in time for Christmas, there is so much more to do. 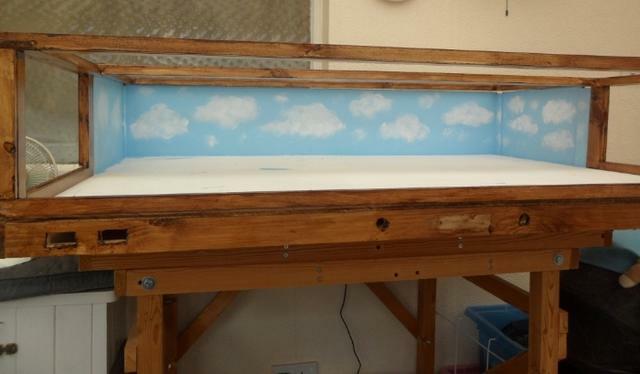 I've just finished varnishing the wood and I've painted the sky on the back board with some fluffy clouds. There are also some holes drilled out in the front of the baseboard ready to take some sockets for the power and controllers. Today I fitted the hinges so that the front of the case can lift up and over for access. I've also fitted some draft excluders to keep out the dust. The perspex glazing arrived yesterday and all fits well. I've yet to fit them in permanently hence why the white protective covering is still on the top panels. The side glazing have been fitted properly with the protective covering removed. I'm also building a stacking shelf system for this and potentially for four other future railway layout projects, so that they can all stack on top of each other and be moved around on different shelf's depending which layout we want on top for display. So once the stacking shelf is built, I'll be able to move the case from the conservatory to the lounge where I will start to build the layout inside the case, I don't really want the case left on the floor of the lounge or left in the conservatory where it could get damage due to someone either stepping on it as well as the conservatory gets very hot in the summer and cold in the winter which wont do the layout any good. Nice work there mate ! can't wait to see it coming together. I'd give you a "P" but I think you have quite enough at present ! steve131 wrote: Looking good Roy. 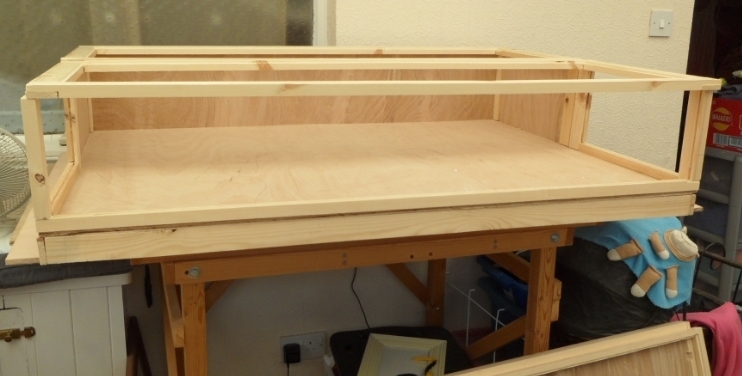 Today I've finished constructing the shelving/storage system for the layouts. 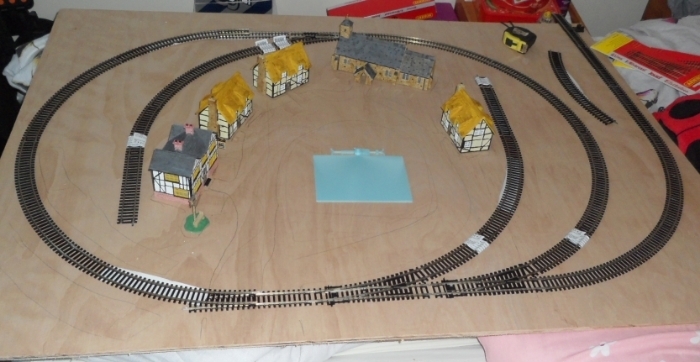 The layout that is running with be positioned on top whilst the other layouts will be stored underneath. When it came to moving the display case, with the glass in place, it was heavy and I needed my daughter to give me a hand. So it might look like I will have to remove the top section when moving it on my own and yes the top section has been designed to be removed for two reasons, one is to allow access if required when laying the track and the other is for glass replacement if need be at a later date. In the photo below, I wanted to test to see if the case fits in-between the racks, but will sit on top of the next level for running the trains. You will also notice that the rack is wider than it needs to be, but I also had to take into consideration my future builds and the required base board sizes. To the left is my Star Wars space ship case waiting to be completed and to the right is another case for displaying our N gauge trains. The shelving has been varnished. 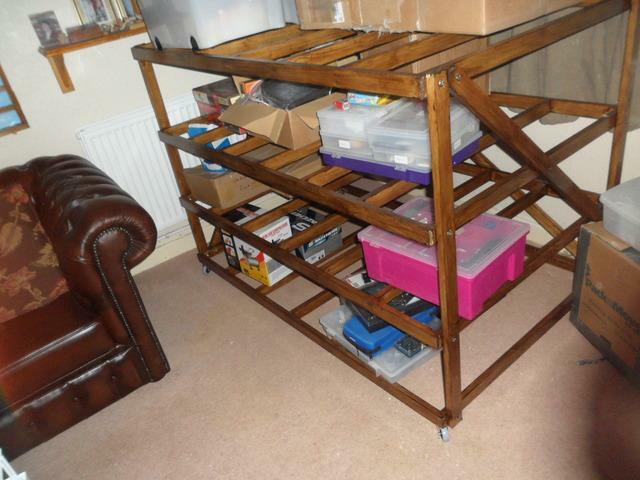 Today I've added some heavy duty castor wheels and I then dismantled the shelving and moved it to the lounge, where I have limited space and was relieved that it fits in nicely. I then manage to fill the shelf's with boxes containing modeling bits and models etc... I'm thinking about fitting a burgundy curtain around the shelving at a later date. I will move the display case into the lounge onto these shelf's once I've drilled out all the holes that are required in the base board. My next step will be to make a working ice pond complete with ice skaters. I'm also looking into the options of motorising the level crossing gates before I lay the track. I've got quiet a few 6 din plugs and sockets which I'm going to use as well as some multi pin computer sockets which I'll be using. I will be making a note of the wiring on the plugs/sockets so that I can use the same ones for all the boards.